Did the recent greenYgrey rebranding cost Green and Grey a place in Britain’s top 50 pairings? That’s been the alpha topic of discussion in the office this week, after the Daily Express revealed a 1000-humans Elizabeth Shaw survey for their new chocolates range. With the greenYgrey now a trio after the promotion of Yellow it might have made the great British public overlook the Green and Grey five-years double act. Green, Grey and Yellow are probably the second favourite trio in Britain now, after the Bronte sisters. Or did the royal couple Kate and William’s Oz visit happen too late to rekindle memories of Grey’s epic Oz ramble by Google Maps, with Green also making an appearance or two. However, the above theory might well be disproved by the royal couple themselves. William and Kate could also now be called a trio, with the arrival of George, or even four including Lupo the dog, but they still made it into the favourite couples list at #28. Only one place below fruit and nut chocolate bars. A better theory might be that the Greenygrey expected too much too soon, with even Aleksandr Orlov and Sergei not making the top fifty. The most recent pair in the Greenygrey genre are Wallace and Gromit, who date back to the 1990s and made it into the chart at #21. Old greats Sooty and Sweep were at #26, and Keith Harris and Orville were the only other anthropomorphic couple, just making it in at #46. Hi, it’s Jack Wolfpac, legendary travel writer correspondent at the Greenygrey inspired by Jack Kerouac in the human world. The Greenygrey hereby claims rights to the discovery of Karaginsky as a little fish-shape to Kamchatka’s big; putting down the virtual Greenygrey flag. If one day approved, it would be the first great discovery of the Greenygrey’s epic fantasy travels by Google Maps. emerging in rocks like birth. haven’t had werewolf for a while. because I can hear winter start to shout. not all the time, not repeatedly. Marc Latham has books available on Smashwords and Amazon (http://www.amazon.com/author/marclatham), including previous Greenygrey’s rambles. Something tells me the Greenygreyliens of yesterday’s blog are somehow connected to Andy Wolfhol’s disappearance. So I think it’s time for the second sensational episode of the XaW Files: Fantasy Travel by Google Maps. The collies introduced themselves as Kolya and Oleg, and said I could call them Kol and Le. They told me more about meeting a werewolf that sounded like our Wolfhol over a herbs and edible roots dinner that warmed me up no end. They said he’d headed south after a couple of days, painting the Siberian scenery as he went. I slept the night in an igloo they set up for me, before heading south the next morning after a very warming berry brekkie. I met a Siberian husky on the crest of a hill overlooking Kresta Bay. He introduced himself as Seb, and showed me a short cut to Anadyr. After reaching Anadyr anudder Siberian husky, called Berian, advised me to head for Karaginsky Island if I wanted to fish for answers about ol’ Wolfhol. 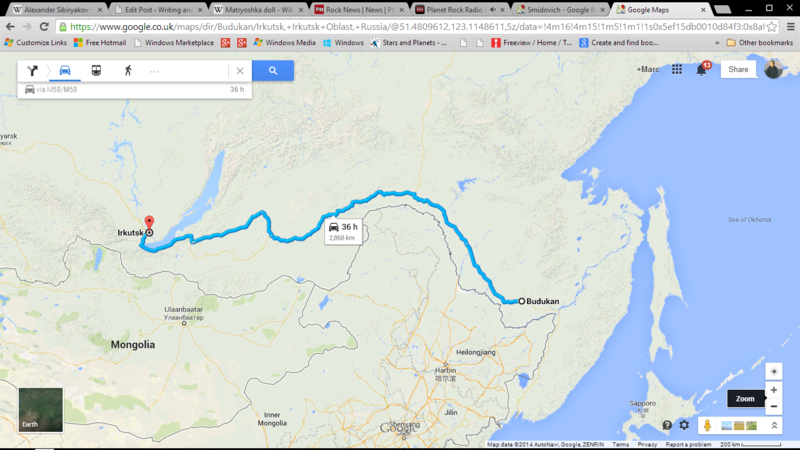 So I continued to the very east coast of Siberia, shapeshifted into a salmon, and swam south. Living down the Litke Strait, for I indeed did feel alive, I realised what Berian meant when I reached a big fish shaped island that had a great greenygrey look to it. I tried to climb onto the island, but when I stepped out of the Strait it swallowed me up. I found myself trapped in the belly of a big fish. As a new Greenygrey’s ramble by Google Maps gets under way, I’m delighted to say that Google UK has a great greenYgrey logo. I didn’t say great new greenygrey logo as I’m not sure how long it’s been there; I only know when I noticed. Hi, it’s Wolf Whitzer with a Greenygrey News (GGN) satirical comedy newsflash, inspired by Wolf Blitzer on CNN. Moreover, remembering the recent greenYgrey rebranding (as I just did! ), there is also a yellow middle courtesy of the o.